High-quality, innovative sensor technology products have been synonymous with CAPTRON since 1983. The focus of development and production is on capacitive sensors for use primarily in industrial automation, traffic and transport and building technology. Since 1994, CAPTRON Electronic has produced capacitive sensor switches for the traffic engineering. Since 2006, capacitive SENSORswitches have been used successfully in the field of safety technology in public transport, such as emergency call and information pillars. 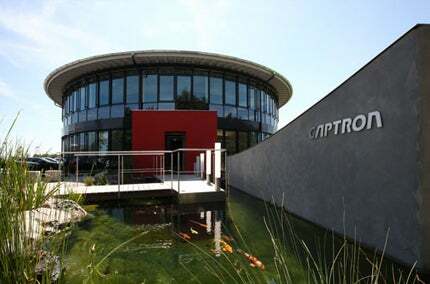 In May 2009, CAPTRON was certified according to DIN EN ISO 9001:2008. Special capacitive technology means that just a light touch on the sensor area is all that is required. The touch button does not need to be pressed with much force, which is an important advantage, especially for children, elderly and passengers with limited mobility. Therefore our products follow the recommendations of the associations and evidently meet the required standards and guidelines of the railway industry. Intelligent and high-tech sensor technology prevents unintended operations that might be caused by rain, dirt or frost. Our products are used worldwide in buses, trams, metros and high-speed trains (bullet trains), regional and national trains, safety systems and emergency call and information pillars and many other areas of local and long-distance public transport. In the long run you save huge costs because of the longevity of our products. With more than 100 million switching cycles, SENSORswitches are exceptionally reliable. In addition, you have no further fees for regular maintenance. Whether wall, door or glass installation, the SENSORswitches can be fitted to its special design flexible and fast and cause only minor setup costs. The company’s management team offers great flexibility and solutions that meet the needs of customers and applications. Beyond the standard product portfolio, CAPTRON is a specialist for individual customer and application solutions. We also offer the opportunity to make your own sensor. China Railways' 380-series high-speed trains rely on capacitive SENSORswitch technology from CAPTRON. SENSORswitch CHT1 is available as hygiene-conforming model. SENSORswitch CHT3 fulfils TSI-PRM criteria. Especially suitable for disabled persons and children. Adhesive mounting onto clear or dark-tinted glass. Adhesive mounting on glass or metal surfaces. Two-sided operation through single or double glass. Capacitive sensors for adhesive mounting behind glass and for activation through single and double glazing. Capacitive stop-request button with optical feedback (LEDs). Capacitive stop-request button with graphic display (LCD). An insight into CAPTRON's cutting edge sensor technology.